Our canine companions carry so much more latent intelligence than most of us know. With the right stimulation and bonding, any dog can be trained. Discovering the personality of your dog becomes a lifelong journey but there are some tools along the way to make things easier. Here we’ll be taking you through a look at the three best dog training products. We’ll be showing you the highlights while pointing out which type of training is best suited to each. The Educator E-Collar Remote Dog Training Collar delivers cutting-edge innovation. This device delivers a tapping sensation which is similar to vibration, perfect for obedience training. We’ll be taking you through a look at its massive range, which dogs it is best suited for, and how it helps your dog training efforts. Educator collars use stimulation which is blunt. This ensures that the incentive is provided without the stress. Low-level stimulation achieves results which are far superior to sharp traditional shock collars. All models also feature a Pavlovian tone. When you hold down a button, your dog will hear this sound. If you continue to hold, the collar releases the electrical stimulation. Rapid association between the sound and commands is made. Even when stimulation is released, the sensation can be compared to a mild tapping instead of an electrical shock. You couldn’t hope for a better dog training color. Shock resistant, waterproof and featuring 2-hour use off a single charge, its ideal for any dog or situation. You can even configure the level of stimulation on a scale ranging from 1 to 60. It’s total range spans no less than half a mile. Two sets of contact points are provided and the collar itself only weighs 1.46 ounces. The Educator E-Collar can be used on any dog weighing 5 pounds or more, and multiple colors are available to choose from. 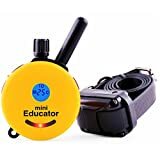 There are also higher-end models available and two-dog Educator units as well. [Upgraded - New Tech]: Unique pavilion shape design, stop excessive, noisy dog barking by emitting an ultrasonic sound to silence the dog. More effective than old version deterrents and waterproof. [High Function & Effective]: Ultrasonic anti barking repellent is effective range of up to 50 feet. And there are 3 range levels and a test mode, you can use the test mode to verify the microphone and speaker are working properly. [Pet & Human Safe]: The ultrasonic frequency is not harmful to pets and completely inaudible to human ears yet safe and effective training tool for your dog or the neighbors dog to disrupt the barking. Effective on most dogs within range. [Cute Design, Easy to Use]: Pavilion shape, durable and waterproof, great for outdoor use, easy to hang on a tree, wall or fence post etc. Add some style to your outdoor decor that brings serenity to your family and your neighbors at home and during camping trips. [100% Satisfaction Guarantee]: If you are not completely satisfied with our product, just contact us, we will try our best to give you a solution. ONLY BUY THE ONE SOLD BY METER.LLC WILL YOU RECEIVE THE PRODUCT, OTHERWISE YOU CAN ONLY GET REFUND BUT NO PRODUCT. Anti-barking devices are designed to help owners of excessively rowdy dogs reach a point of control. Collars such as this training device from Meter.llc should be used during select training intervals or times when you know your dog’s barking poses a serious problem. For those who need the help, the Meter.llc Anti Barking device is a best seller using ultrasonic waves to quieten any noisy pooch. Let’s take a closer look at how it works and what makes it a great dog training product. This anti-barking device runs on a 9-volt battery and activates automatically on the sound of barking. All that you need to do is place the unit within range of your dog and the unit detects the sound of barking. Upon detection, it releases an ultrasonic sound inaudible to humans which will silent any dog. Some users have used it to silence the hounds of noisy neighbors but its best for training. If your canine won’t stop barking despite all begging, commanding or any attempts at prayer, then give this unit a try. Place it and turn it on, commanding your dog to stop barking. After a few repeated tries, an associate should be made between the command and the sound. The tone is effective enough to stop incessant barkers immediately. While you shouldn’t need to use it for too long, the quality is clear. This is a dog training product which is sure to last. Even the packaging is superior to most pet products. Downtown Pet Supply delivers a dog training lead which works as good as it looks. Highly functional, practical and stylish, this is an essential tool for almost all dog owners. Available in varying lengths and colors at rates which can’t be beaten, you’ll love the versatility which it gives to walks. Heralded as the best longline available, this is a lead which works as well for casual training as it does for outright obedience. 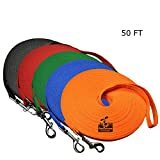 Here’s a closer look at this excellent Dog Recall Training Agility Lead from Downtown Pet Supply. Lengths available range from 15 to 100-foot. You’ve got five colors to choose from and the quality of construction is clear. The width measures 5/8th inch and a swivel-style bolt snap gives the maximum resistance against twisting. Each lead is made from nylon providing high durability. The quality also benefits from reinforced stitching and the clip swivels are nickel plated. When you opt for one of these excellent leads from Downtown Pet Supply, your dog can wander as much as it wants. Cotton webbing guarantees that your lead is tough enough to withstand the strength of the largest dogs. Knots come out without damaging the rope, but your dog won’t be able to chew through it easily. Play frisbee or fetch while never having to worry about your dog being off its lead. With a little practice and training, you’ll soon be able to love the recalled lead at home. Not everyone will need an anti-barking device but for particularly stubborn dogs it’s invaluable, so the Educator E-Collar Remote Dog Training Collar gets our top vote. Almost every owner will reap rewards when training their canine companion with the help of the Educator. Thanks to its tone, you’ll seldom have to resort to anything more than a few mild vibrations before an association is set in stone. Dogs learn exceptionally quickly using this tool. Without question, the best lead available to any dog owner is the reliable, long-length recall training agility lead from Downtown Pet Supply. Even if you aren’t interested in dedicated recall training, it’s still the most versatile leash you’ll find at its price.